1994 348 Challenges _of 32 how to confirm "factory" challenge cars. 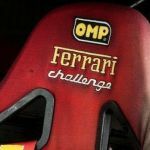 I am trying to find out if there is a primary source other than the plaques in the 1994 "factory" Challenge cars that enable us to confirm the _ of 32 numbers. I have a car that I am caretaker of SN #97985 represented as 24 of 32 but can find no documentation of this other than on various registries. Re: 1994 348 Challenges _of 32 how to confirm "factory" challenge cars. Thank you for providing the list. My question that I am struggling with is we see this list, but where does this information originate from? Lorin - Thanks again for taking on this challenge - and thanks to everyone else that is [url=http://buyessayxus.com/]helping[/url]. It will be great to have it updated once again.